Hometown and University: Boyertown, PA; Muhlenberg College (Allentown, PA). ETA location and year: Yogyakarta, Central Java; 2013-2014. 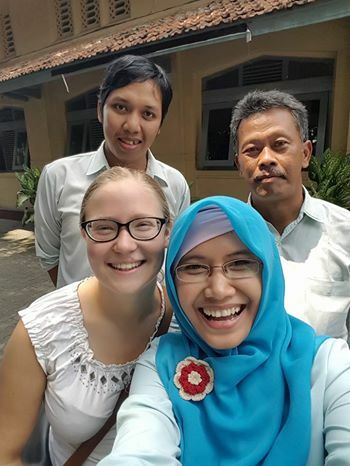 Life after Fulbright: Three years after I began my Fulbright grant, I’m actually back in Indonesia, and still hanging out with AMINEF staff and former Fulbrighters. I’ll soon be starting year three of a PhD program in ethnomusicology at UC Davis, and am currently exploring around Jakarta, meeting people, and asking lots of questions in order to determine if my current research project is feasible. I’m most interested in the relationship between music education, specifically what guidelines there are in the 2013 national curriculum (which many schools were transitioning to at the time of my ETA grant), and the creation of a national identity in a country made up of so many varied ethnic groups, each with their own styles of traditional and popular music. I entered my PhD program immediately after Fulbright, and it’s been a great way to keep learning about Indonesia—and teaching about it in the world music class I T.A. for—and hopefully I’ll be back here full-time next year for field research. I’ve also continued my Indonesian language study with SEASSI (the Southeast Asian Studies Summer Institute in Madison, Wisconsin), which I highly recommend for any Fulbrighters who want to keep up their language skills. The Fulbright was a fantastic way to get to know and love this beautiful, diverse country, and I’m thankful every day for the chance to come back here.